Patience is A Virtue that I am Yet to Adopt. I made my first batch of brownies today! It is not my intention to sound exceedingly arrogant but I have to say that they tasted delightful – Even better than pastry shop ones. They were gooey, squidgy, soft and all things chocolatey. Immediately they were done, instead of being a demure domestic goddess and waiting for them to cool, I shamelessly stabbed it with a knife and took my first piece. I am unrepentant and I haven’t looked back ever since. I have nothing against plain brownies, but I much prefer fussy, fancy ones with a bit of crunch to them so I added shredded coconut to mine. Whatever you choose is fine – be it cute little chocolate buttons or anytime type of nuts, it really is up to you. Melt the butter and chocolate together in a large pan. In a separate bowl, beat the eggs with the sugar and vanilla. Measure the flour into another bowl and add the salt. Once the chocolate mixture has melted (be careful not to burn it!) let it cool for a bit before beating in the eggs and sugar. After this, add the coconut and flour. Mix until smoothly combined and then pour every bit of this sweet sweet mixture into the lined tin. Bake for 25 minutes- You’ll know it’s ready once the top is dried – the inside will be dense and gooey- THIS IS PERFECTLY FINE! 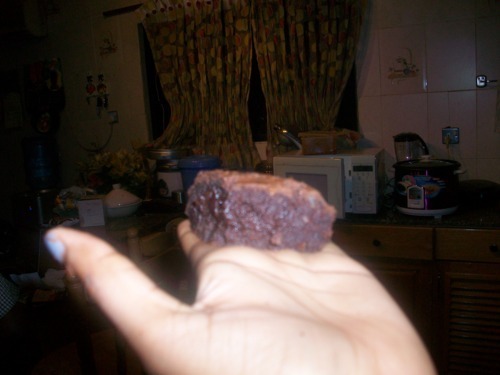 – brownies carry on cooking as they are left to cool. Seriously, do not over cook. You really don’t want the 3D Brownies – dry, disgustingly dull brownies. Now don’t do what i did, which was to dive straight in. Let it cool before you mark your territory with your knife! Now, Smile as you eat!